This ensemble features 25 large flat note cards, 25 medium flat note cards embossed with your personalization and 50 blank matching envelopes. Your choice of triple thick stock color and typestyle. 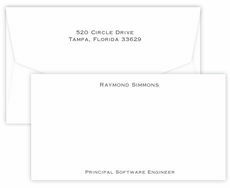 Embossed return address and optional envelope linings available. Positioning only as shown. Large size note cards are 7" x 4.8" and medium size note cards are 6.2" x 4.5"
It is exactly what I was looking for. Previous orders were perfect.